I hope everyone had a wonderful Thanksgiving! We ate way too much food, but it was delicious! No turkeys were harmed...we had a vegetarian meal. Here is a new challenge you might be interested in joining: Take It Further. 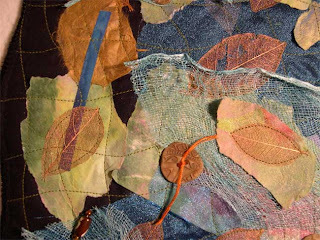 It's a fiber art sort of challenge. I just joined and hopefully it will inspire my creative muse to do more. It will be something to look forward to for the new year. 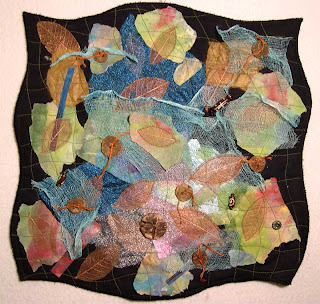 The "wool felted leaves" is part of a class assignment I did in a class I took from Jane LaFazio. 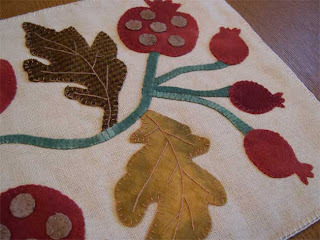 We were to create something from felted wool. This will probably be a pin cushion. It is hand stitched...whew...took me forever and I was a bit rusty. The class is now over, but I still have two more projects to complete. Susan, in answer to where I am from....Yes, I am a Buckeye, too! Go Bucks! Happy Thanksgiving! I just found a fantastic recipe for cinnamon buns this morning that is sooooooooooo quick and easy and sooooooo delicious that I thought I would share my version with you. It is all made in the same dish. Mix batter ingredients together in a pre-sprayed 8x8" baking dish. Let rest for 10 min. (I used a spoon to mix it) Combine cinnamon mixture in a small bowl by mixing with fork. Top batter evenly with cinnamon mixture. Using fingers, poke topping thoroughly into batter. Bake by placing in a cold oven; set temperature to 350 degrees F; bake for 25-30 minutes, until lightly browned and firm in center. (It will look lumpy by now) Cool 10 min. 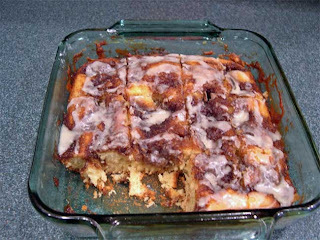 Drizzle icing over warm cake. Delicious yeast cinnamon rolls. I cut into squares and as you can see, we ate two already. Yummy! Have a great T-Day! (I found the recipe at the Fleischmann's website). 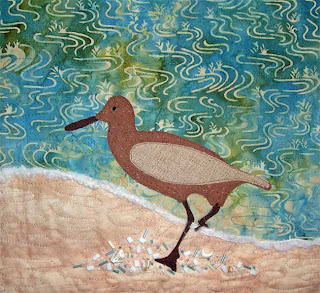 This one is "Little Beach Bird". It is from a photograph I took while at the beach this year. These little guys are so hard to photograph because they move so quickly. It is suppose to be sort of whimsical, not too realistic. 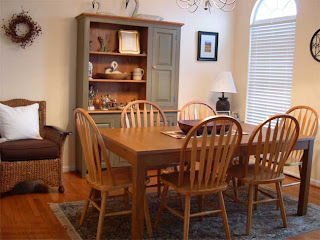 We had a very busy weekend...we shopped for a larger dining room table and we found one! It opens up to 102" (two leaves) which is too large for my dining room, but with one leaf, it is perfect to seat 8. We are having all our kids here for Christmas and we want to sit comfortably at the table. We put the old one in our kitchen dining area and it is great there. The good news is, we can use the chairs from our old set for the new table. As you can see, we had to put our wicker chair in the dining room out of Emma's reach...she decided she would love to chew the legs on this one. So, we have to use baby gates to keep her out of here. 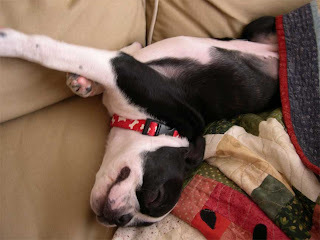 Hopefully, when she gets all her teeth, she will stop the chewing and we can put the chair back in the family room. The chair is from Pier I and the dining table is from IKEA. 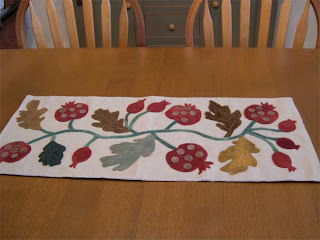 This is the table runner you see on my table. 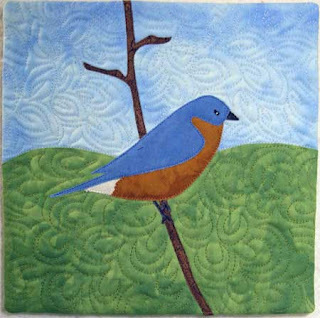 I made it when I worked at the quilt shop in Ohio. It is a pattern by Ginger Sanchez, "Antique Pomegranates". The runner is all hand stitched using hand dyed wools. The background is linen. I used a lot of patterns when I worked at the shop. We bought the patterns and materials and made the samples for the shop and taught classes. I miss those days. Here is my challenge quilt for my art theory group. The background has torn, painted paper towel, polymer buttons that I made, skeleton leaves, painted cheesecloth, sheer fabrics and batiks. If you click on the pictures, they should enlarge so you can see it better. It really was hard to photograph due to the "I need better lighting in my studio" factor (hint to hubby). The polymer clay buttons are fun to make. I machine quilted it and zig-zagged the edges. (I even got out my Janome 9000 when my Bernina was being snobby about stitching on the edge). What do you think? I do appreciate your comments! This is Maya (the little one) and Barley. 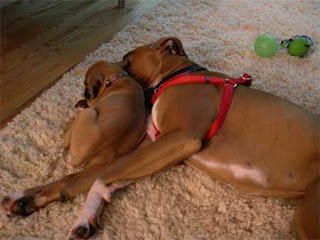 They are our Boxer grand-dogs. Aren't they cute? Maya is about 2 months old in this picture, Barley is about 10 months old. So sweet! Maya taught Emma to walk down the stairs at the house in Columbus, but here at home, she still won't walk down the stairs. She can jump up on a stool but, nope, no stairs. She can go up them, but then she's stuck. I am suppose to be working on an art challenge quilt for my art theory group tomorrow. I will post some pictures of it when it is finished today. I have lots of quiet time today...hubby was still up at 6 am working on the computer (work things) when Emma woke me up for her morning routine. We were suppose to do some Christmas shopping today. I want to get a larger dining room table since we are having all the kids here for Christmas, but then you have to buy chairs...I did notice in the latest Martha Stewart Living mag, that one of the Christmas dining lay-outs showed a beautiful table and most of the chairs did not match. What's wrong with that, you ask? It's perfectly fine to do that...it's just how I was raised in the good old South...all dinnerware had to match, all napkins, silverware, chairs, etc. Not so today! I'm trying to change. Our TV is flat-lining intermittently when we are watching a really good movie. Guess it's time to get one of those "new" TVs. We rented "Mr. Brooks" last night. I fell asleep in part of it....it is a really disturbing, sad, sick-o movie...do NOT rent it (that's my advice). What a waste of $! I also heard this morning that there is a new children's movie coming out based on a book written by an atheist where the heroine is trying to kill God. Check it out for yourself: http://www.snopes.com/politics/religion/compass.asp It's the Golden Compass. I would not want my children or grandchildren (if I had any) or grand dogs to see such a movie, nor would I support it with my $. That's my opinion because I love God. Now if you want to see a really scary movie, it's Vacancy. We rented that one last weekend. It's an on-the-edge-of-your-seat-movie. But just a movie and definitely Not for kids. Thinking of Christmas and the holidays, I am writing a little tutorial today to make a wool-felted star. So, check back later and I will post a picture of it and you will love how much fun it is to make. 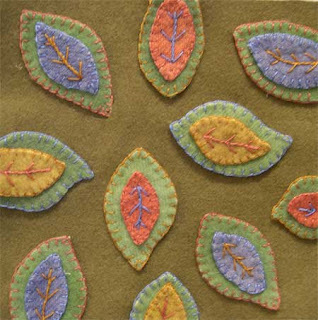 It is all hand stitching and embroidery but you can also make it on the machine. Thanks for listening today! 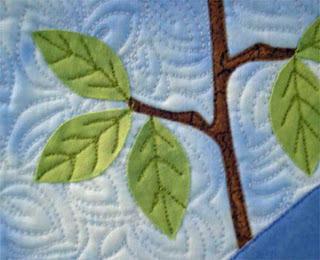 I decided my Little Bird quilt from the previous post needed some leaves on the trees. Here it is, I think it is done. Yes, it's done... "Do things better & do them done! "...Aby Garvey. I found Aby's website by accident yesterday and she has some great tips on it. I may order her book...she is a productivity expert & organizer. I like the things she says about perfectionists...how they procrastinate because they know they can't make it perfect or it doesn't get done at all. I know that fits me to a T! So, I want to "Do it Done"! Check out her website...it has lots of organizing tips and there is a newsletter. Today is a very special day...it's our son's birthday! Happy Birthday, Matt! He should return today from military duty, so I'm sure it will be a great b-day. He's a good son and good-looking, too. On Nov. 7, a group of religious leaders, members of congress and others met in Washington DC on Capitol Hill to sign a proclamation for the kindness to animals. You can read the proclamation and sign it on line here. Please help to prevent cruelty to animals. They hope to get a million signatures. I have been concerned since reading and hearing about the recent Virginia Puppy Mills sting, not to mention the dog fighting. How awful what was found in my own state...dogs that had never been out of their cages, no human love, no treats...just treated like machines. Finally, something will be done with all of our help. So, please read it and sign it on line and past the link on to everyone you know that loves a pet. If you don't have a pet, you are missing out on unconditional love...the best kind. OK, that is my plea for this morning. 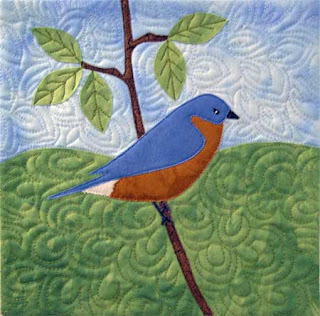 I'm off to stitch some quilts. (or paint, glue, melt, emboss, or...maybe some shrinky dink charms today). Yesterday, I had internet problems and could not log on, thus no blog or email! I had to call Verizon and first talk to a robot (a polite one) stating my problem. Then, a polite tech lady who had me crawling under the computer and running up to the third floor to check computers there and back under the desk, unplugging and plugging. Nothing worked, so she dispatched a repair person to my door. I was impressed to say the least and who do they send??? A Verizon lady who also owns a Boston Terrier! (I bet Verizon knows I have one...I wonder about those electronic "boxes" with the blinking lights I have in each room.) Anyway, Emma loved her and must have known she was a Boston lover, too. Oh, and the Verizon lady just took one look at my router and installed a new one and everything works faster. She was so nice and friendly unlike the Verizon man who installed our equipment when we moved in. She even said, "nice set-up" for my studio. I am sure there are some who see my room and eyebrows shoot up, and I can see they are looking for the nearest exit! Only other quilters, mixed-media and stamping lovers can relate to "I must fill every square inch of space...oh, there's a 12" x 12" spot...more fabric can go there". It is amazing how much you can pack into a room, but we might need it, right? 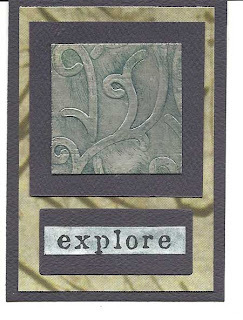 This ATC was made using silver Foil HVAC tape found at the hardware store. The tape has a peel off backing which makes it great for artwork. This one has the look of old pewter or tarnished silver. I also made the Christmas card below. Here is a tutorial of how I got the above effects on the tape. 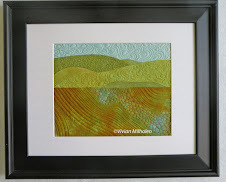 The supplies I use are Staz-On ink pads in Saddle Brown and Olive Green, Apple Barrel Meadow green acrylic paint, Adirondack Alcohol inks in Denim and Bottle, a embossing plate, the foil 2" HVAC tape found in hardware stores, felt pads to apply inks and paint and cardstock. First, cut the desired length of tape and peel the backing. 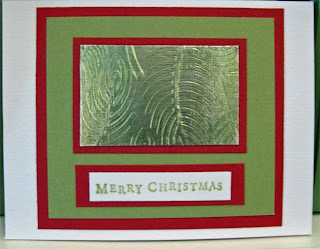 Place it on a piece of cardstock (this gives it strength and holds the embossing better). 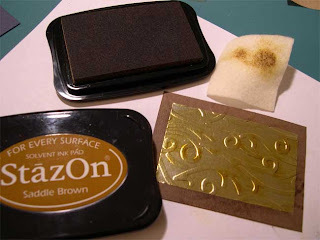 Emboss in a machine (I use my Big Shot) or rub the foil face down on the embossing plate. 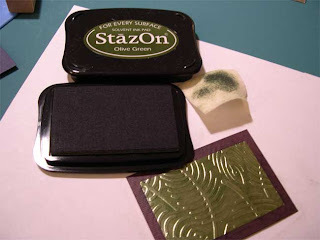 Apply Staz-On ink pad direct to foil to get the desired colors. Wipe away ink until you like the look. You can always add more later. Work quickly before it dries. I used Olive Green and Saddle Brown. 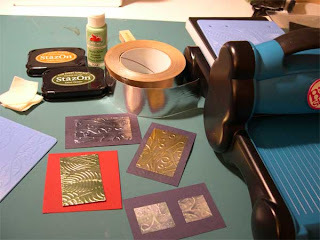 Using this method, the foil will change color, but remain shiny. I used Olive Green for the Christmas card. 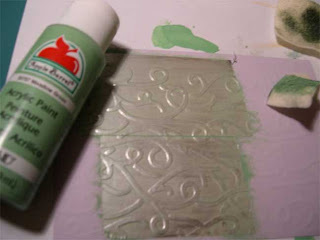 To get the pewter or tarnished look of silver like in the ATC apply a thin coat of the acrylic paint after embossing. Wipe away until it only looks dull like the picture below. 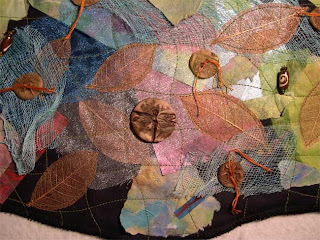 Then apply the alcohol inks to the felt pad. I use a few drops of each color, then a few drops of the blending solution. I then dab the ink onto the foil until I get the look I desire. You then wipe it off until you like the look. 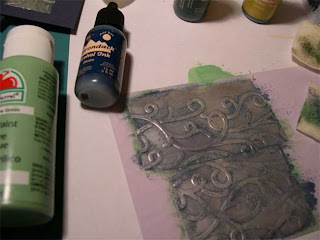 You can apply more ink or less until it looks like old pewter or tarnished silver. I like to put another coat of the acrylic on, wiping it very gently to get a thin coat. 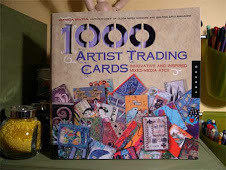 Cut them up, use a punch, glue, whatever, to make ATCs and cards. Have fun! 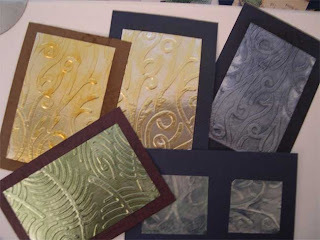 Below are some of the samples before I made cards from them. This is a picture of my new quilt to be. I bought these 5" quilt squares this past summer from a quilt shop in North Carolina. They are all of the "Fresh Air" line by Moda. I just love the colors. This will be a lap quilt when it is all done. As you can see, there is a mix of blues, reds, oranges, pinks and browns. 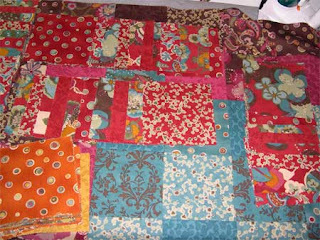 I am calling this my "Free Spirit Gypsy Quilt". Yes, I did plan a pattern to stitch them together...but it soon became a free spirit and we bonded. The once planned border will now be the binding. I will attempt to fire up my HQ16 (shock!) to quilt it. Stay tuned for final details.